বিনোদিনী। বিহারীবাবু, লজ্জা করিয়া খাইতেছেন না, না রাগ করিয়া? আর-কাহাকেও ডাকিয়া আনিতে হইবে? Asha nudged Binodini while Bihari ignored the remark. 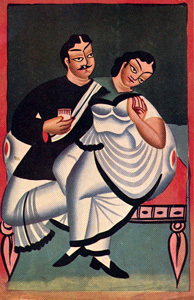 Binodini had already noticed that Bihari would never take part in teasing Asha. She could not bear it that he treated her lightly but respected Asha. 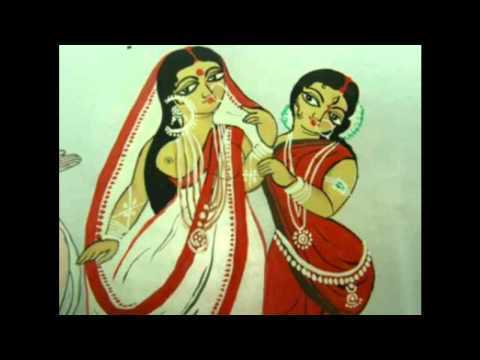 Binodini understood that Bihari was there to ruin her plans and that she would have to have her wits about her in his presence. Bihari’s voice betrayed his emotion. Binodini: Biharibabu, are you not eating out of reticence or out of anger? Should I fetch a rather special person to request you? Bihari: There is hardly any need for that. This is more than enough. Binodini: Are you teasing me? One can never win with you! I have not succeeded at shutting you up, even with a mouthful of sweets! That night Asha expressed her annoyance with Bihari to Mahendra once again. Unlike all the other times, Mahendra did not dismiss her words with a smile but joined in whole heartedly. Mahendra was reassured by this; he had not hoped to solve the issue quite so easily. He used to fear Bihari for his ability to read him. Bihari: I heard from Mahendra that you are annoyed with me as I come into the inner quarters of the house. I have come to ask forgiveness and leave. Binodini: How is that possible Biharibabu! I have come only for a day or two, why should you leave on my account? I would not have come here at all if I had known there would be so many problems. Binodini seemed to hold her tears back with difficulty as she quickly left with a sad face. Rajlakshmi: Not as such but she says people will talk if a young widow stays with strangers for such a long time. He looked reproachfully at Bihari who was sitting there. Bihari thought with some remorse that his remarks of the previous day had been somewhat critical and that Binodini must have been hurt by them. Both husband and wife felt anguished by Binodini’s behavior. Nothing more was decided that day. Binodini said, ‘No, it is best that I go. There is little to be gained by extending these ties for two more days.’ She looked at Mahendra with mute appeal in her eyes as she said this. Bihari: If you leave, I will be left wondering whether you left, angered with me. As she spoke huge tears began to fall rapidly down her long thick eyelashes. Asha who had been sitting in a corner with her head covered began wiping her tears away. After that, Binodini never talked about leaving. This entry was posted on July 30, 2013, in Rabindranath Tagore's Novels and tagged চোখের বালি ১৬, Chokher Bali 16, Rabindranath Tagore's novels. It is very late at night in summer. Not a single leaf moves in the still air. The heir to Jessore, Pratapaditya’s eldest son Udayaditya sits at the window of his sleeping quarters. Beside him sits his wife Surama. Surama held the prince’s right hand with both her hands in great anguish and looked at him as she sighed slowly. She would give her very life to satisfy his wishes but this particular wish was not to be fulfilled that easily, this was her sadness. Udayaditya smiled gently and took Surama’s anger -reddened face in his hands and held it. In an instant he grew serious and said, ‘No, Surama, I really do not have the intelligence to run the kingdom. There have been enough tests of that. When I was sixteen years old, the king gave me the charge of Hosseinkhali district to teach me the business. Within six months there was great confusion. The revenue decreased, the subjects blessed me. The staff complained about me to the king. Everyone in the court thought if the prince is so beloved of the subjects, then it is evident that ruling will never be done well by him. Since then the king did not consider me much anymore. He would always say – the fellow is going to be just like our uncle in Raigarh, Basanto Ray, prancing around and playing the sitar while the kingdom goes to the dogs. Surama had not understood anything erroneously, she just believed in the wrong ideals; even though she knew it to be contrary. She hoped that he would do exactly that. This entry was posted on May 18, 2013, in Rabindranath Tagore's Novels and tagged বউঠাকুরাণীর হাট, BouThakurani's market, Rabindranath Tagore's novels. মহেন্দ্র। আমি কি ছেলেমানুষ। নিজের ভালোমন্দ বুঝে চলিতে পারি না? রাজলক্ষ্মী। (আত্মগত) ওরে বাস্‌ রে! উনিই কর্তা, শাশুড়ি কেহ নয়! কাল বিয়ে করিয়া আজই এত দরদ! কর্তারা তো আমাদেরও একদিন বিবাহ করিয়াছিলেন, কিন্তু এমন স্ত্রৈণতা, এমন বেহায়াপনা তো তখন ছিল না! Mahendra did not sleep well that night. He was at Bihari’s house as soon as it was dawn. ‘The more I think about it, it seems to me that it is my aunt’s secret wish that I marry her niece,’ he said. ‘That is quite possible,’ Bihari agreed. Rajlakshmi: She has no family to speak of, who will I call my in laws? Mahendra: I have to admit the lack of in-laws does not pain me as I really like this girl. Bihari said, ‘Why would I let her go. Mahin himself has organised this match. 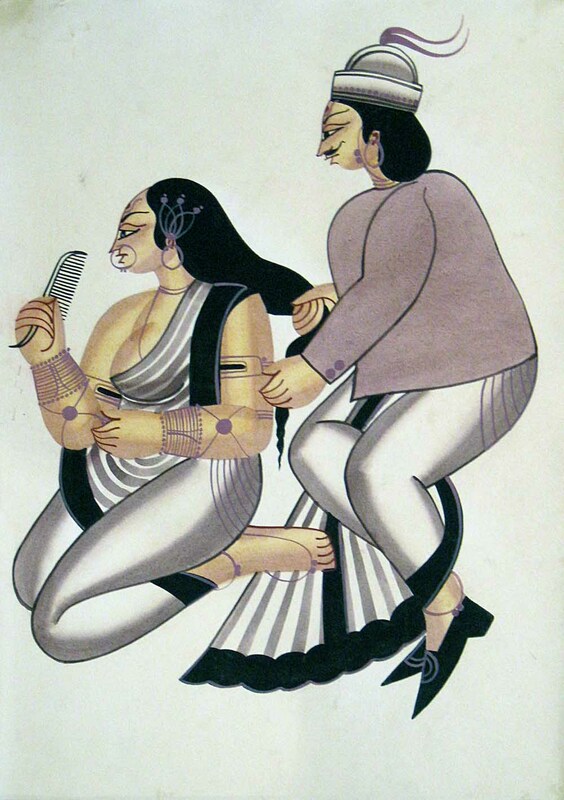 Mahendra became doubly angered by these events hindering him from marrying Asha. He decided to punish his mother and aunt by moving into a very average hostel for students. Bihari went away leaving Annapurna in tears that she tried to suppress fearing they would bring bad luck to Mahendra. She told herself again and again; whatever has happened is for the best. This bitter, silent war went on between Rajlakshmi, Annapurna and Mahendra till the day of the wedding was upon them. Then all the lights were brightly lit, the flutes played their sweetest tunes and there was no lack of sweetness in any of the dishes prepared. Asha stepped into her new family home for the first time, beautifully dressed and shy with wonder; her gentle fearful heart blissfully unaware of any thorns in this nest of hers. She was filled with relief and joy as she was finally coming to live with the only person who had been like a mother to her. This entry was posted on May 4, 2013, in Rabindranath Tagore's Novels and tagged Chokher Bali, Rabindranath Tagore's novels, recent Rituparno Ghosh film.